This is part four of Jodie McCarthy’s, Amanda Viviers’ and Elaine Fraser’s online book club. What is the first thing that comes to mind that’s annoying you, or you just can’t shake that you need to do? When I do that thing, and then the next thing on top, and the next, eventually I get to a place of peace. I get an amazing sense of relief when those things that have been niggling at my brain have been taken care of. Somedays it is something as mundane as sorting the washing. Other days it might be relationship repair, like writing a letter of apology to my daughter. On another it may be calling a friend or writing that blog post that is due. But when it comes to conversations with those closest to me, often I gloss over what’s on top. Instead, in response to ‘how was your day?’ I reply with my stock of common phrases: ‘It was OK; good; or the kids did this, that and the other thing’. Because isn’t it true that when we come to prayer we also have a stock of common phrases, rote words that we trot out daily. In Present Over Perfect, Shauna Niequist (an avid foodie) likens prayer to a bottle of salad dressing. Salad dressing is one of the easiest things to make. The standard mix in our house is good olive oil, balsamic vinegar and a dash of seeded mustard. Shake it together and you’re good to go. 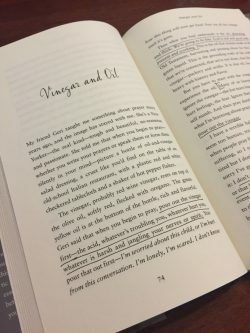 If you would like to join or follow the journey of Amanda’s, Jodie’s and Elaine’s book club, make sure to check back at 98five.com every Monday, Wednesday and Friday or view their schedule here. …when you begin to pray, pour out the vinegar first — the acid, whatever’s troubling you, whatever hurt you, whatever is harsh and jangling your nerves or spirit. You pour that out first…Then what you find underneath is the oil, glistening and thick: We’re going to be fine. God is real and good and present and working. The thing is, what is on top often isn’t pretty. It is often the morning argument with your husband that has been niggling at you all day. Or the worries you have about the study you are undertaking. Or that annoying situation at work that just can’t seem to get resolved. I often fall into the trap of wanting these interactions with my closest family to be lovely. To not be grumbling or complaining in these precious conversation times. So in these conversations or prayers, I have a tendency to gloss over the hard and choose something prettier to share. And like Shauna I ignore the hurt and the fear and ‘pray dutiful, happy prayers’. But that’s not real. That’s not allowing myself to be seen, that doesn’t create deeper relationships. This is why I love the Psalms so much, they often start from a place of pain, a place of questions, a place of despair. They start with what’s on top, whether it is pretty or not. Why Lord do you stand far off? These Psalms pour out the vinegar first, the psalmist pours out to God what is on top. And as the vinegar gets poured out then the oil is revealed. The affirmation that God is real and good and present and working. You hear O Lord the desire of the afflicted, you encourage them and you listen to their cry. Like us, the psalmist is sometimes in a mess of his own making. Sometimes he is in a mess of someone else’s making and sometimes he is totally bewildered as to how his circumstances came to pass. But he is honest and vulnerable, he shares what’s on top, he pours out the vinegar and makes way for the oil. So our discussion question for today is what’s on top? It may not be pretty, it may be mundane, but pouring out that first helps us get to the oil underneath. You have to pour out the acid before you can get to the richness, and you can’t get there unless you’re willing to truly be seen, vinegar and all. Join us in this Present over Perfect journey.